I am struggling hard to jot down anything these days. My mind is like a blank white paper when I sit down in front of my PC. I sense the lack of motivation deep inside me. Too many things are happening around and the focus is getting distracted. There might be a kindle of my passion lying deep down in my heart, which might be the one thing that drags me back into the track. I wish I could do a better job in blogging with a consistent schedule. We all admit that old is gold, especially when it comes to the recipes that are handed to you from generations to generations. The first person who comes into my mind when I mention food is my late Grandma. My grandma was not a vegetarian, but she mostly preferred vegetarian food and occasionally small fishes. Most of the vegetables were grown in their backyard. I remember that there was a section for taro root plants in my grandparent’s backyard. The harvested taro roots were stored in dry place to be used in off season. On those days, nothing goes into the trash as each and every part of the harvest was used in some manner or other. 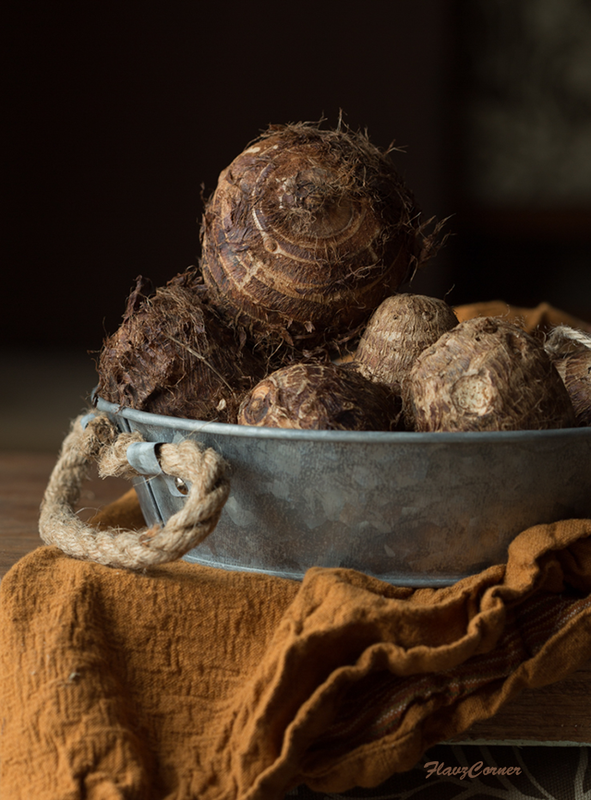 She was a pro in transforming the taro root into delicious dishes. 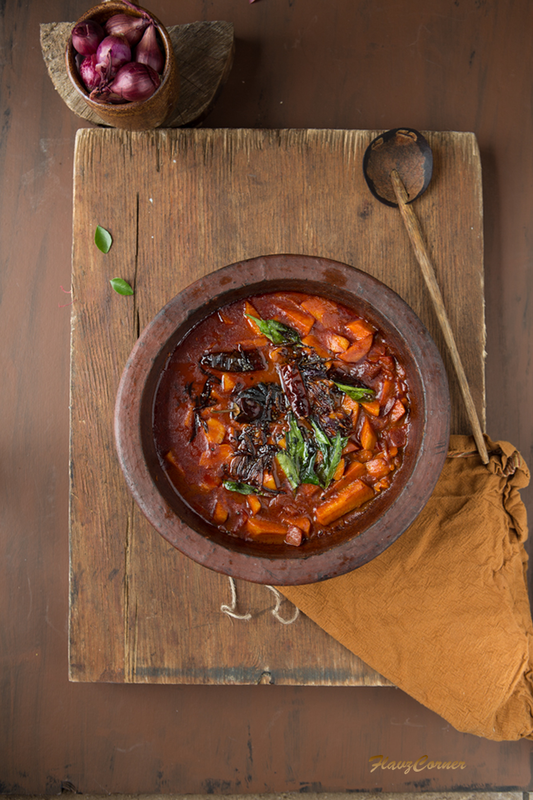 Even a bowl of the steamed taro root with spicy bird eye chili chutney was served as a quick evening snack. She used to make a fresh coconut paste based yellow curry with the taro root which was one of her best dishes. Oh, those memories make me drool. Fish curry was a daily fare in my grandparent's house as others in the joined family preferred a daily quota of fish. 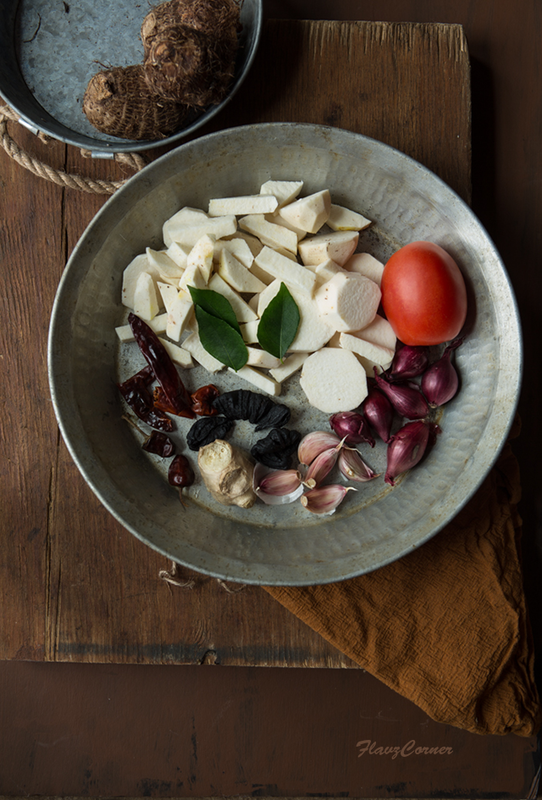 During lent time she makes this special curry that tastes just like fish curry with freshly harvested taro roots. My attempts to replicate the curry never yielded the same taste as what she used to prepare. I don't think that even my Mom makes it the same way. But here is my take on her recipe. 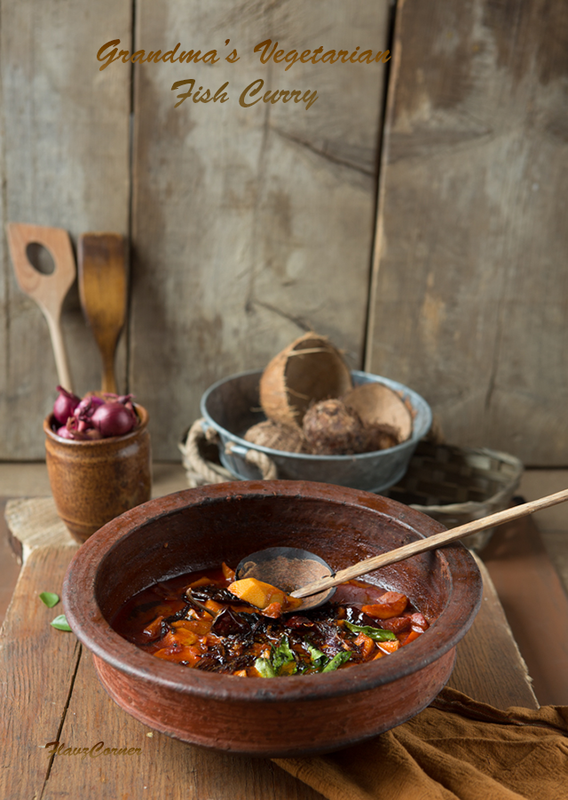 Freshly harvested taro roots and earthen pot contributes to the flavor of this dish. I prepare this curry during lent season to get the feel and flavor of fish curry. It’s best when served with plain steamed rice, buttermilk and a stir fry. Peel the fuzzy skin of the taro root and cut them into one inch long pieces and wash them thoroughly. Use a kitchen gloves or a strainer to wash it, otherwise it can cause itchy feeling to your skin. Wash the fish tamarind good and soak in 1 3/4 cup of water. In a earthen pot heat oil and saute ginger, garlic and shallots till light golden brown. Lower the flame and add all the powders and cook till the raw smell goes away. Add the cleaned taro root and mix well. Cover and cook for 5 minutes on low flame. Now add the chopped tomato and curry leaves and saute till the tomatoes are slightly mushy. Add the tamarind piece along with the water and salt. Cook it with a lid on for 15 - 20 minutes on low to medium heat till the gravy starts to thicken up and the taro root is well cooked. Prepare the tadka by spluttering the mustard seeds in 1 tbsp of oil in a separate pan. Add the shallots and red chili and cook till light golden brown. Turn off the flame and add the curry leaves. 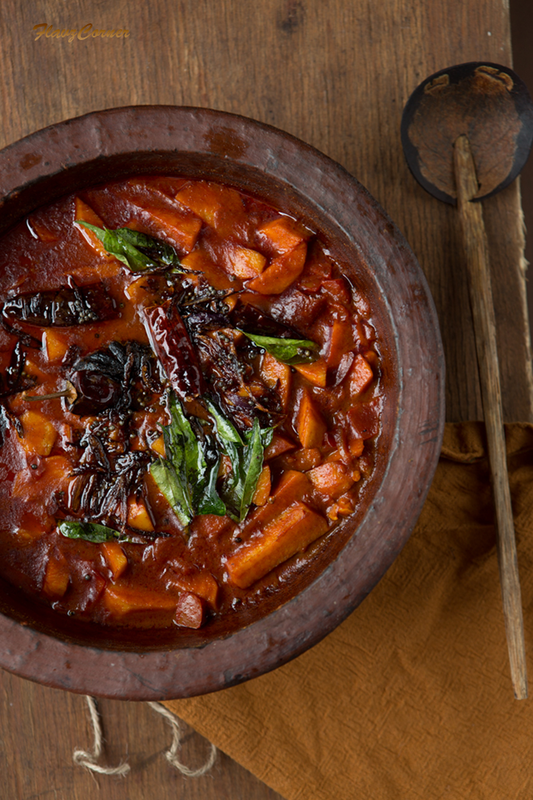 Pour the tadka over the prepared curry and enjoy it with plain steamed rice and seasoned buttermilk. I love everything made with taro root. I have to try this. Nice set up pic very rustic and exactly those days kitchen would look like. Shibi I came to say I tried this curry today it was deliciousss. The taro root haters scrapped the pan clean. Thank you for the recipe.Please bring more of grandma's curries here. Thank you so much Meena!! I really appreciate that you came back to comment after trying it. Your comments are my are motivation. I am glad that I was able to share the recipe and your family loved it. The color of the curry look so beautiful. My mum used to make stir fried and curry taro. My brother liked the curry one but I somehow always prefered the stir fry. But one look at your curry and I want to dig in! 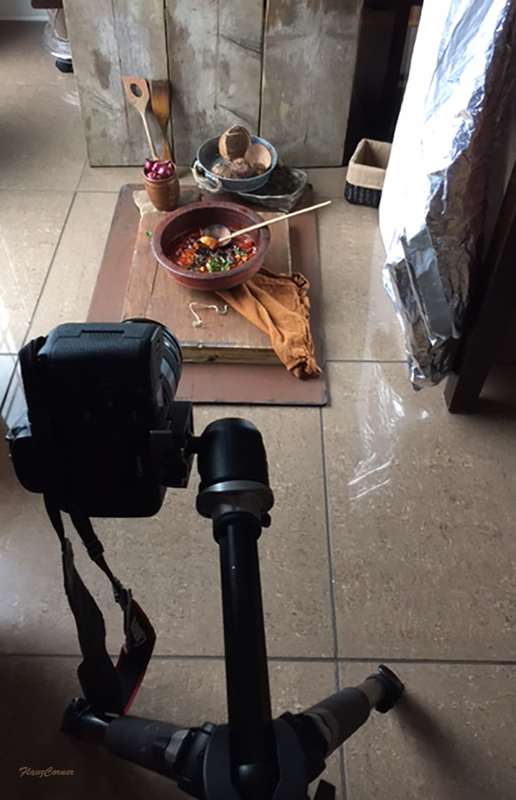 Fun photo of the shooting set up! Love the dish, too. I'll have curry any (or every) day of the week. Thanks!